After a long day's work, one of the best ways to relax is to run a nice bath and get cozy in the bathtub. For those of you who know me well, you know I love beauty products that are fresh and smell amazing. I don't like overly sickly sweet scents or anything too overpowering. I've got news to tell you, and it's that I've found the absolute best smelling shower foam you have ever smelled. This post is in collaboration with and sponsored by Caress. 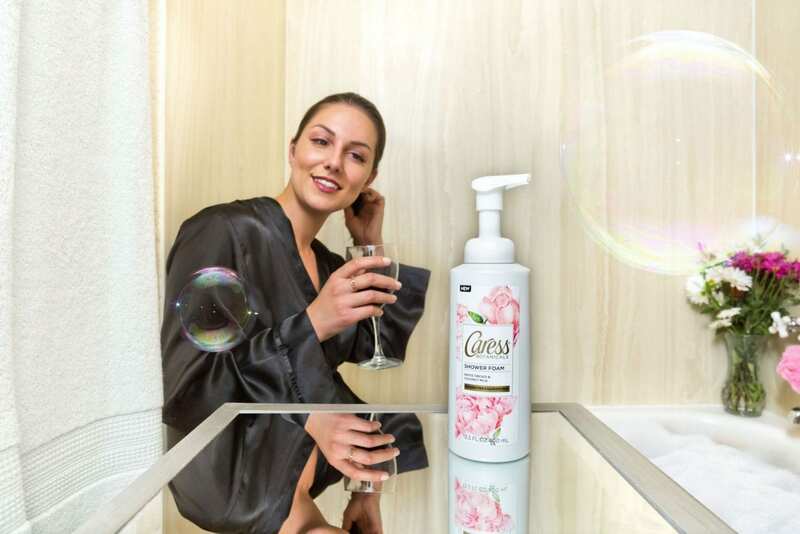 The Caress Botanicals Shower Foam is extraordinary, and smells delightful. This shower foam is the perfect consistency for not only washing the body, but also shaving. As you apply to the skin, it foams up beautifully. When it comes to botanicals, there's something so magical about a combination of white orchid and coconut milk. The base note is cedar, amber & sustainably sourced copaiba oil, while the top note is coconut milk, vanilla and some spices. Finally, the heart notes are white orchid, rose and jasmine. The conglomeration of these ingredients truly makes this the dreamiest scent. Ideal for relaxation. The packaging is also very convenient because you easily press the pump to release the product. The formulation is paraben and sulphate free. Ever since I started using this shower foam, my body has been significantly more moisturized. Usually after shaving, my legs are extremely dry. After using this for a week, my legs are not dry after a shave and I finally have silky smooth legs. "Ever since I started using this shower foam, my body has been significantly more moisturized." There's a medicinal element to water, and just immersing your body into a warm bath. Not only is it relaxing, but it's great for tired and sore muscles. When it comes to relaxing, laying in a bath for an hour is one of the best remedies. I made sure to bring in the shower foam to make some serious bubbles. Many people like to bring out a nice book they've been holding off on reading, when they're in the bath. This is one of my favorite things to do as well, and I finally have a book to read. Lemonade? Ice cold water? An ice cold beer? Glass of wine? Whatever you fancy, grab it and savor each sip as you enjoy the warm water, along with a book. Relaxing is so much easier said than done (especially for someone like me) but this is the true testament to how a nice relaxing evening can be spent. While work may be on your mind, and you may have a million things to do, just enjoy the moment when you don't have to do anything. Sit back, enjoy the book and grab a sip. What're your favorite ways to enjoy a relaxing evening?